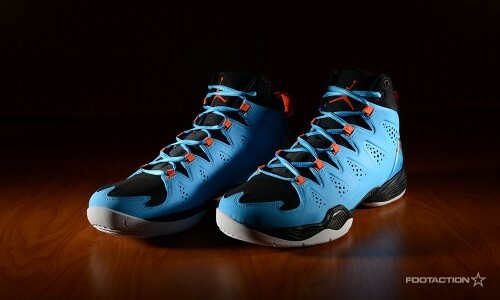 Carmelo Anthony’s 10th signature shoe with Jordan Brand, the Jordan Melo M10 comes in a black, powder blue and orange colorway to match with the uniforms worn by the New York Knicks. With legendary Nike designer Tinker Hatfield assigned to collaborate and design the decade milestone shoe with Anthony, he said “Tinker and I were focused on every detail from the foot molding down to the little specs. We looked closely at the evolution over the years – what’s your inspiration from then to now – and tied that in to ten years to make this the most powerful shoe I’ve had, to-date.” The sneaker incorporates Jordan’s signature Flight Plate technology and a chrome-finish heel counter that incorporates Melo’s first cursive signature logo from ten years ago to make this a true commemorative product. Print article This entry was posted by hhcblog on January 5, 2014 at 1:46 pm, and is filed under Footwear. Follow any responses to this post through RSS 2.0. You can leave a response or trackback from your own site.